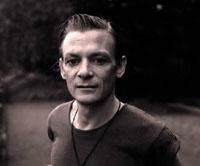 Det er bare noen få dager siden vi brakte nyheten om at Chris Whitley var alvorlig syk. cancer, his label said on Tuesday. He was 45. Springsteen, Dave Matthews and Keith Richards as admirers. starting out in New York when punk and New Wave were the dominant styles. spread the word about his talents, resulting in nine labels vying to sign him. York-based Messenger, which released his last album, »Soft Dangerous Shores,« in July. Whitley recorded a follow-up, »Reiter In,« which has not yet been released.